Hebrews 11:4(KJV); By faith Abel offered unto God a more excellent sacrifice than Cain, by which he obtained witness that he was righteous, God testifying of his gifts: and by it he being dead yet speaketh. Often times, we relate with faith that raises the dead, makes the lame walk and opens blind eyes. 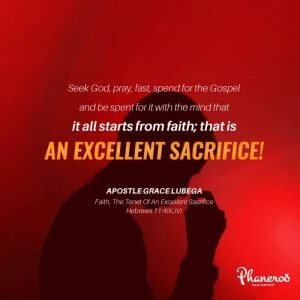 Today, I want to introduce you to the faith that prompts “an excellent sacrifice”. In Genesis 4:3-5; the Bible gives an account of how Cain and Abel brought their sacrifices unto the Lord. However, God accepted Abel’s sacrifice while that of Cain was rejected. The Lord asked Cain, “if thou doest well, shalt thou not be accepted?”(Genesis 4:7). The ‘doing well’ envisaged in this context had nothing to do with the size or nature of the sacrifice; it had everything to do with FAITH. Beloved, it’s not in the many sacrifices you make in and for the gospel. If FAITH is never attached to them “thou doest not well” before God! Seek God, pray, fast, spend for the Gospel and be spent for it with the mind that it all starts from faith; that is AN EXCELLENT SACRIFICE! PRAYER: Heavenly Lord, I thank You for the gift of faith that is active and operative in me! I do all that I do in the knowledge that it is firstly by faith. I respond to what you are doing in me, God; for it is not by my power not by might but by Your Spirit. I pray in Faith, I give in faith and I serve in Faith. This testimony of faith makes me a distinctive minister! In Jesus’ name. Amen.